That's how the retired mathematician Allan MacLeod came across this equation several years ago. And it's really very interesting. Honestly, this is one of the best Diophantine equations I've ever seen, but I did not see very many of them. "95% of people will not solve this riddle. 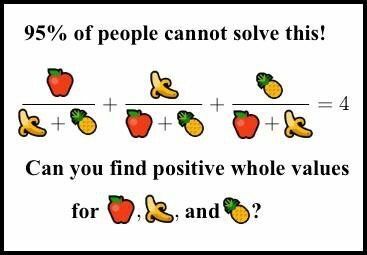 Can you find positive integer values? " You probably already saw similar pictures-memes. It's always the cleanest rubbish, clickbites: "95% of MIT graduates will not decide it!". "She" is some stupid or poorly formulated task, or a trivial warm-up for the brain. But this picture is completely different . This meme is a clever or malicious joke. Approximately 99.999995% of people have not the slightest chance to solve it, including a good part of mathematicians from leading universities that do not deal with the theory of numbers. Yes, it is solvable, but at the same time it is really complicated. (Incidentally, it was not invented by Sridhar, more precisely, not completely.) See the story in this comment ). You might think that if nothing else helps, then you can just make the computer solve it. It is very simple to write a computer program to find solutions to this seemingly simple equation. Of course, the computer will find them sooner or later, if they exist. Big mistake . Here the method of simple computer enumeration will be useless. A Canadian game developer, Christopher Albeluhn that has seven years of experience lost his job, but he did not lose his optimism. 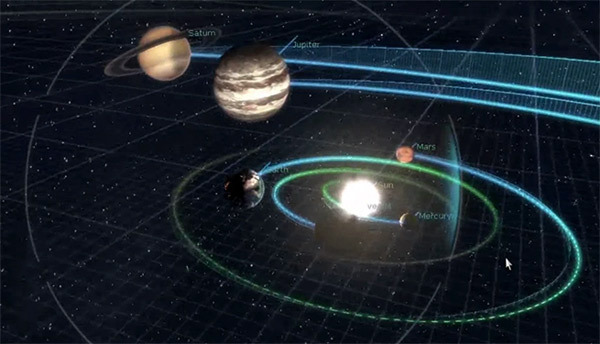 In his spare time he began to make a new project that was supposed to strengthen his portfolio, namely it is a model of the Earth that is powered by the Unreal engine. Most users of electronic books know that the device’s display is very fragile. Many owners of these devices complain that sometimes the weakest impact on the surface of the table can crack a display. Probably, the problem is exaggerated a bit in the most cases, but it would be nice to get a more reliable screen that will not crack due to the careless use. It is likely that the problem will be solved in the next few months as AUO Company has created a flexible e-paper, which is resistant to accidental falls. 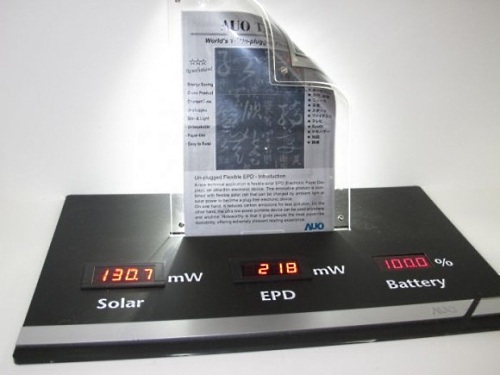 Besides other advantages, the AUO’s flexible e-paper is able to work from the flexible solar panels that were designed specifically for this project. This development is called Unplugged Flexible E-paper. The company has already introduced a real prototype of such flexible e-paper, but the release date of the project and the price of e-paper are not known yet. At least, the Unplugged Flexible E-paper is no longer just an idea that exists in the form of a computer model, technically it is all achievable, and as we can see that is implemented.